Hamleys, the world’s largest toyshop with its flagship store in the UK, has opened its first store in India at High Street Phoenix, Mumbai. Gudjon Reynisson, Hamleys’ global CEO, said at the preview last week that even though it took “250 years for Hamleys to come to India" (the toy shop was founded in 1760), he was happy that it was finally here. And so are we. 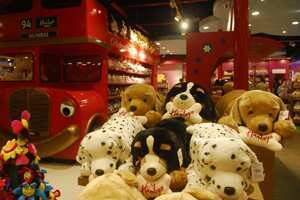 The store in India is a joint venture between Hamleys and Reliance Retail Ltd. The first floor is dedicated to toys. It begins with the soft toys section, which has fluffy animals of every size and shape possible. Live-sized gorillas, cutesy owls and koalas slouch next to the standard bears and puppies. The rattlesnake collection particularly caught my fancy. These 5ft-long, soft, colourful and most importantly, harmless, creatures are priced at Rs425. The franchisee store has around 6,000 toys on sale right now. These include Lego games with which you can construct an entire city, WowWee tiger cubs that respond to touch and sound, board games such as Cranium and Dr Wood’s series such as Heist, LoKulus and Tribe, and Playmobil construction sets—the biggest is the train set that costs Rs16,999. The girls’ section is slightly disappointing, with Barbie hogging the limelight. There’s also a Barbie salon and spa, where little girls can dress up as Barbies and get Barbie haircuts too. The second floor has a small but neat collection of video games and children’s books (both British and Indian titles). There is also a room where children can hold birthday parties. Most of the brands at the store are available elsewhere too—the advantage is that here they’re available under one roof. There’s also a sweetmeat stall, a Kodak photo studio and a magic-tricks corner to complete your toy store experience. In the next six months the second store, a smaller version, will open at the Express Mall in Chennai. And in the next couple of years, Hamleys will set up shop in Delhi and Bangalore too. P.S. Don’t take the children the first time you visit the store; you don’t want them to see how childish you can get. Hamleys is now open at High Street Phoenix, Lower Parel, Mumbai.